The new Kansas City Star Block-of-the-Month quilt, “Hazel’s Diary”, made its debut in the House & Home section of yesterday’s paper. I also know that some of you are afraid of applique — go on, admit it! I’m here today to tell you — you don’t have to be afraid of the applique on this quilt. 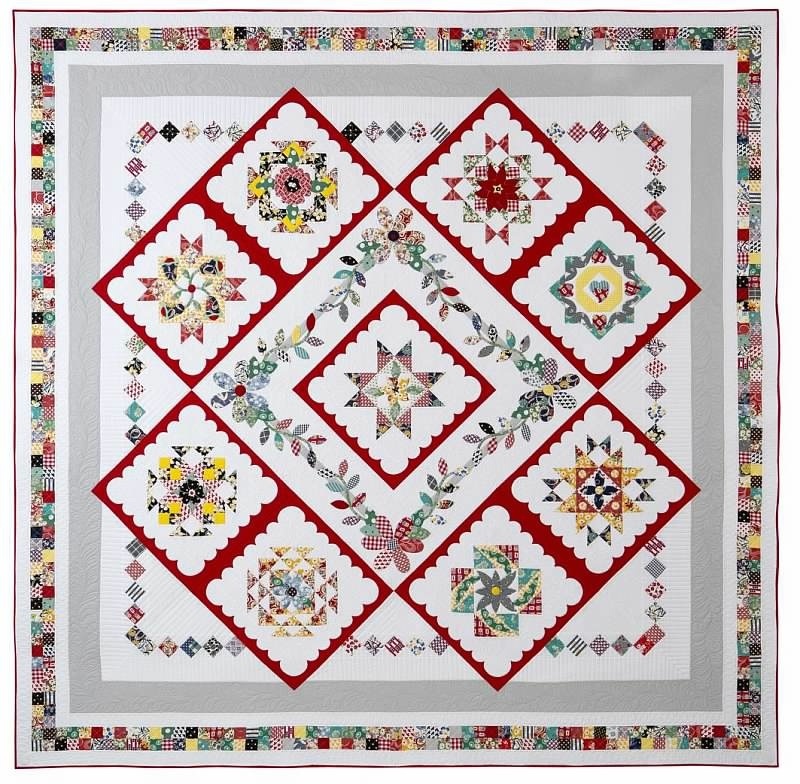 In fact, if you’ve been wanting to learn applique, this is actually a great quilt to try it on. 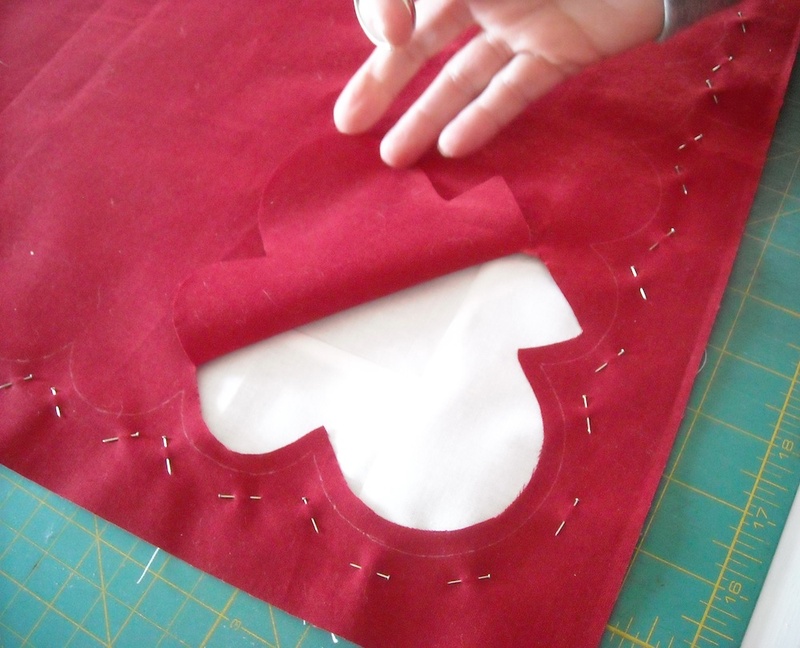 The pieces are few, they’re simple, and you can use whatever applique method you prefer to attach them. I’ll put some links at the bottom of this post that can help you out. Today, I’m going to show you exactly how to do that red scalloped frame around the blocks, using two different methods. So if you’re hesitating about trying this quilt because of that — fear no more! This is gonna show you how easy it is, and then you can jump right in and make this quilt like a pro! First, a few basics that will be necessary for either method. 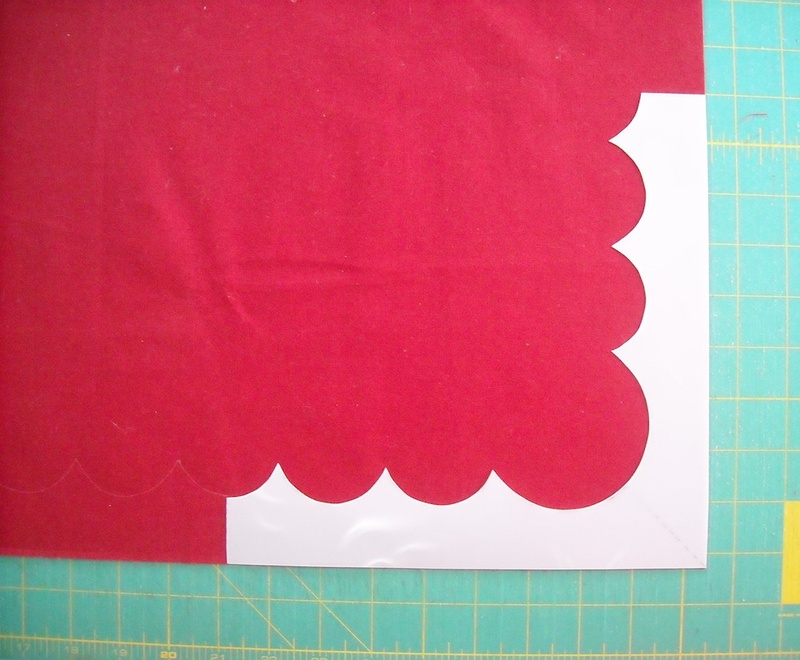 These tutorials assume that you’ve already completed the pieced portion of the block and added the wide white frame around the edge (because that’s what the red frame gets attached to). You’ll want to make a template for the frame. You’ll need some template plastic, scissors to cut it with, and a pencil to trace it onto the plastic. If you need the template pattern, you can download it for free HERE. Here’s how I made mine . . . Trace the template pattern onto the plastic. 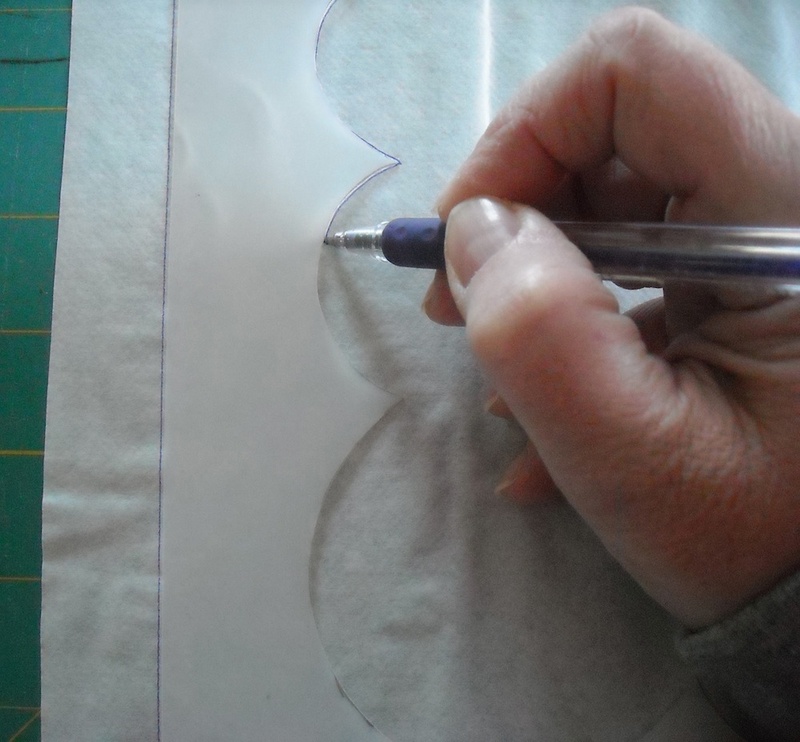 Flip the plastic over, and line it up with the pattern as shown and trace it again to get 1/4 of the entire design. Cut the template out on the lines you traced. 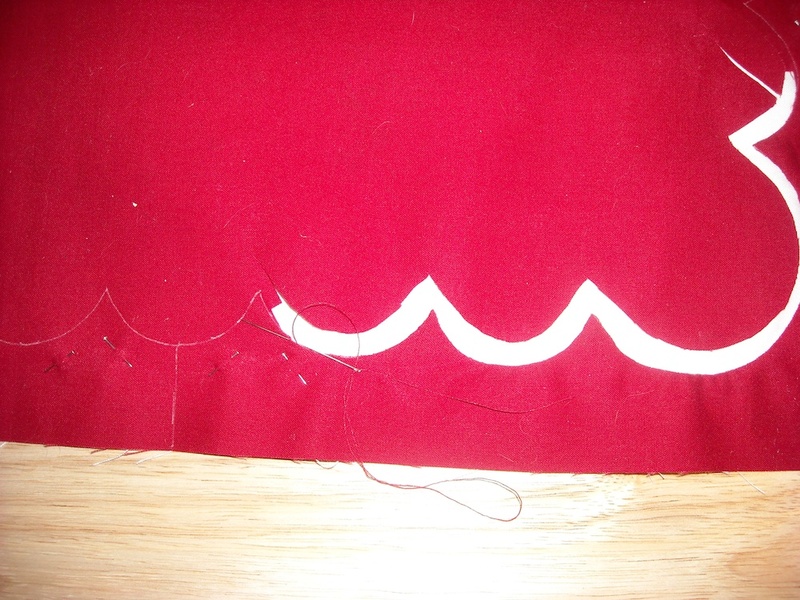 Next, I’m going to show you how to attach the frame using the needle-turn method of hand applique. 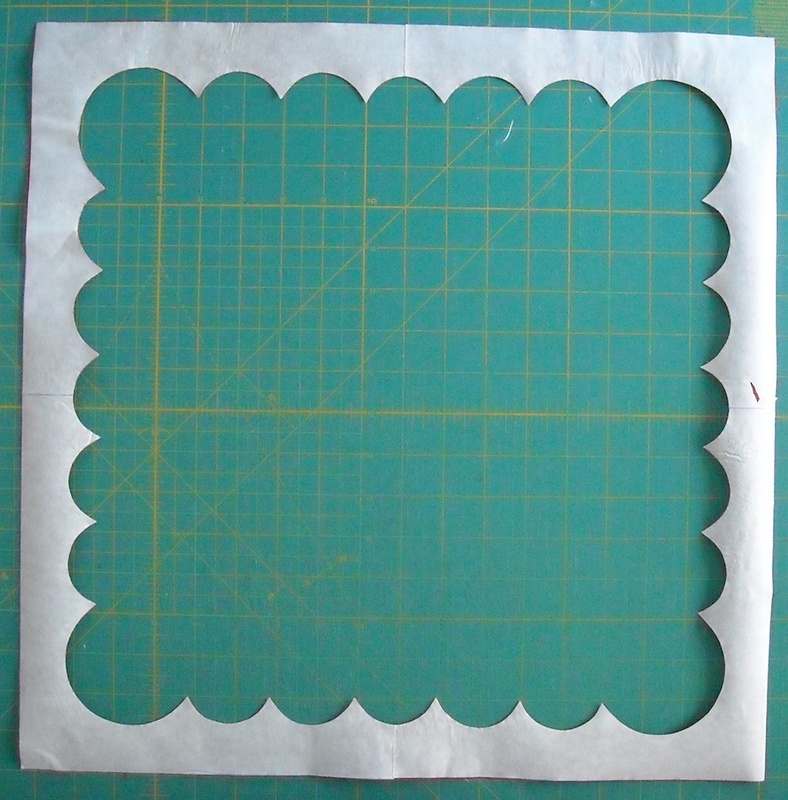 The directions for the fusible version are below that, so scroll on down if you prefer that method. 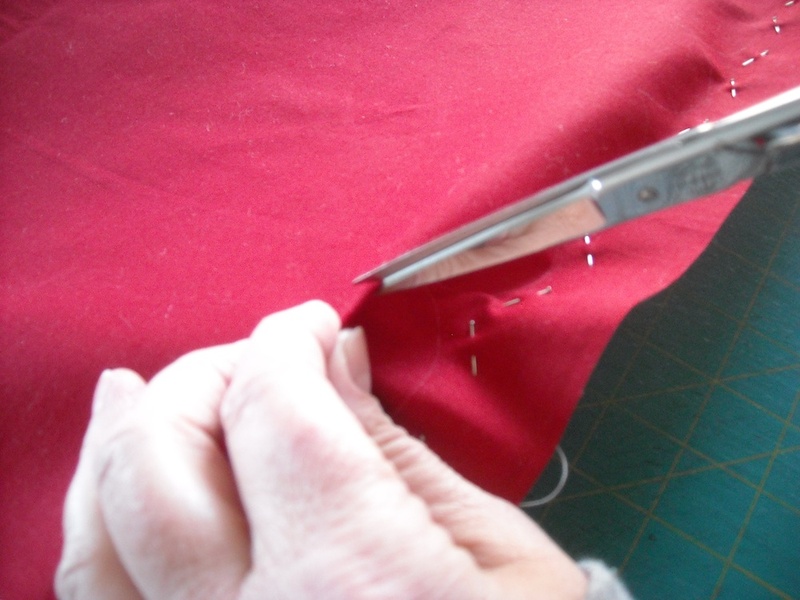 You’ll need your finished block, your piece of red fabric for the frame, matching thread for hand sewing, a needle, your favorite thimble, and some pins and a pair of scissors. 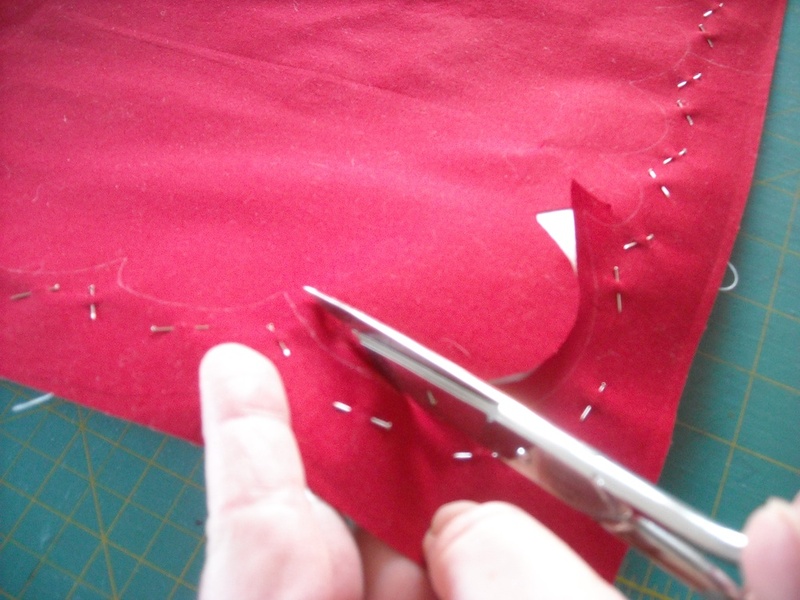 You’ll also need a marking pencil that shows up on your red fabric (but will wash or iron out easily). 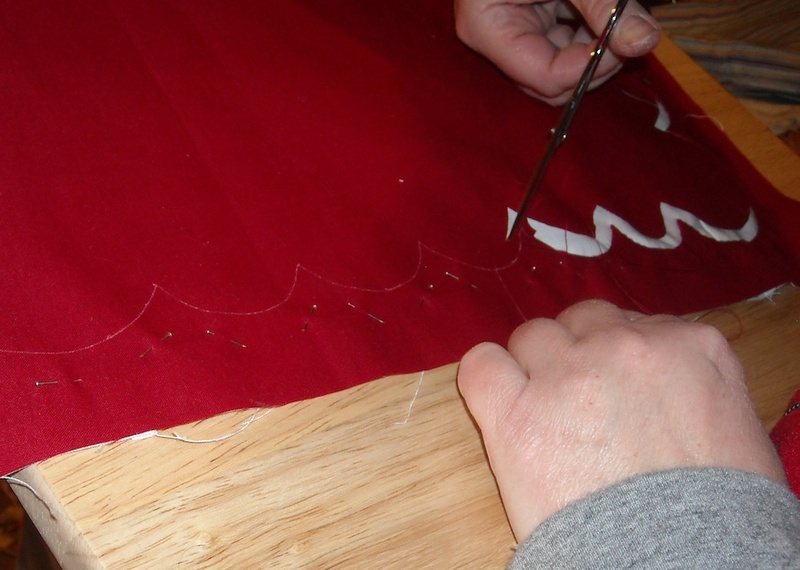 And before we start, let me state that this frame uses “reverse applique”, where we’re cutting out the middle to sew down the inside edge, rather than regular applique, where we’re just appliqueing down a shape around its outer edge. 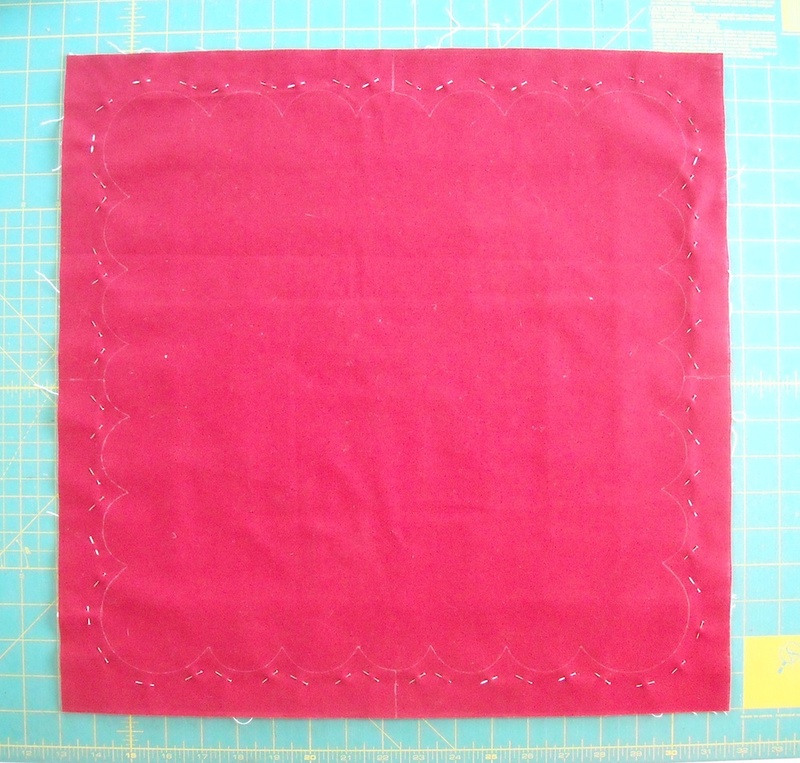 From your red frame fabric, cut a square 18 1/2″. Lay it out flat on your work surface, right side up. 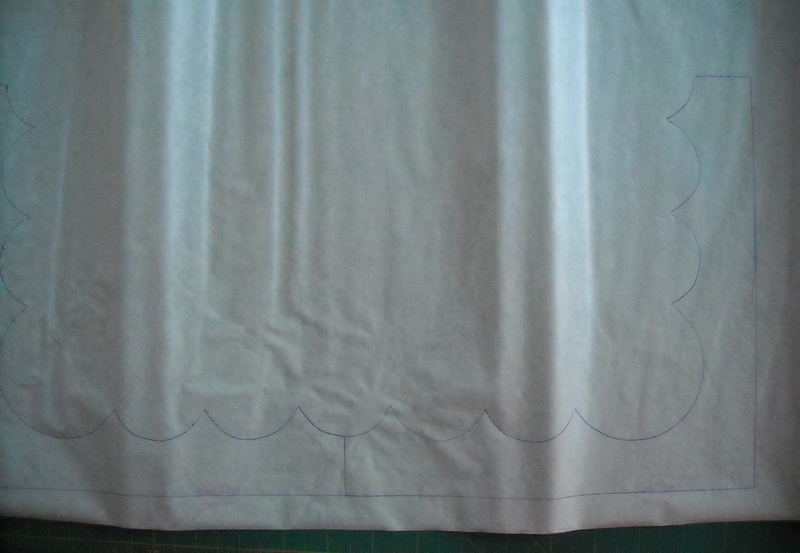 Using the template you made (see above), we’re going to mark the outline of the frame onto the right side of the fabric. 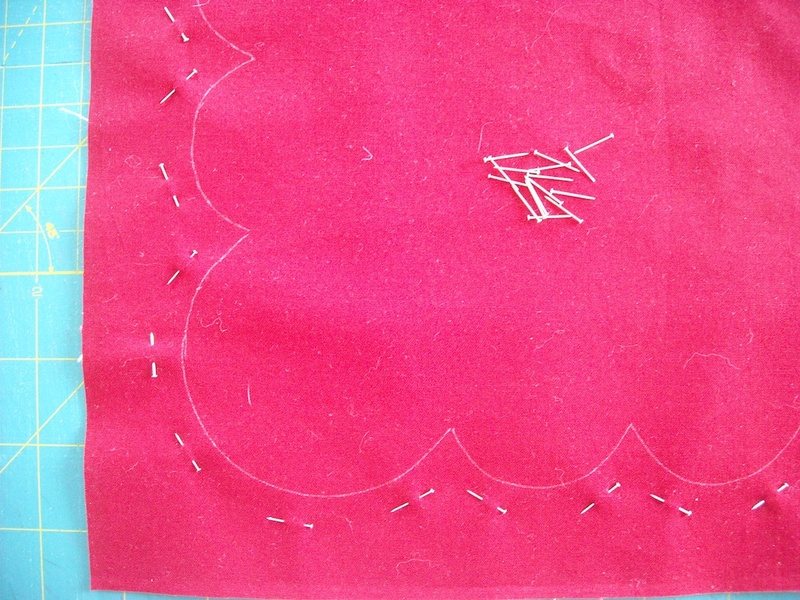 Place the template on one corner, lining up the edge of the template with the raw edges of the fabric. 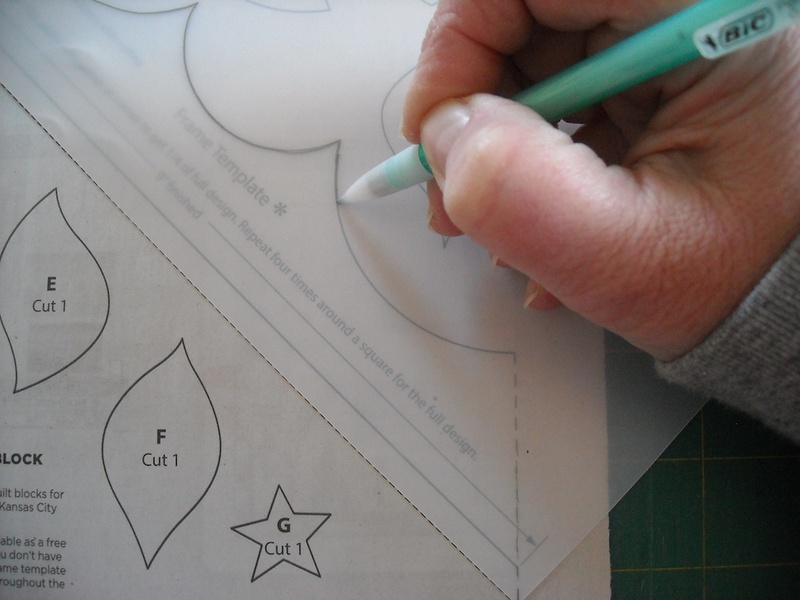 Trace around the inner edge of the template with your marking pencil. 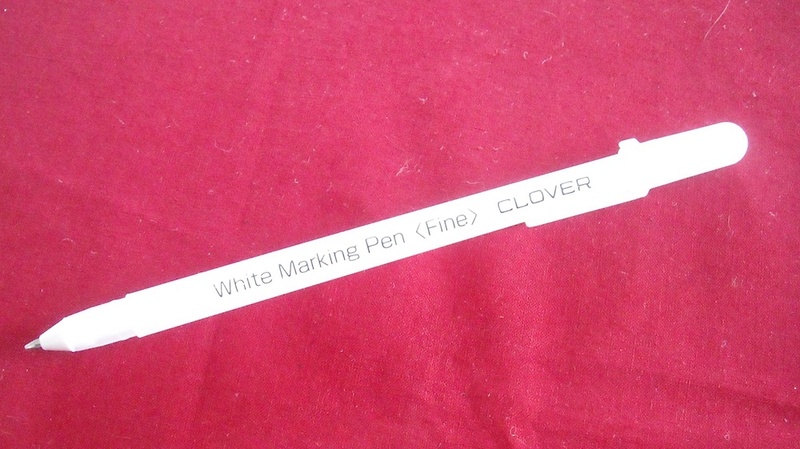 I use this Clover White Marking Pen — it makes a fine line easily, and it irons out. Move the template to the next corner, and trace again. Repeat for the two remaining corners of the square. 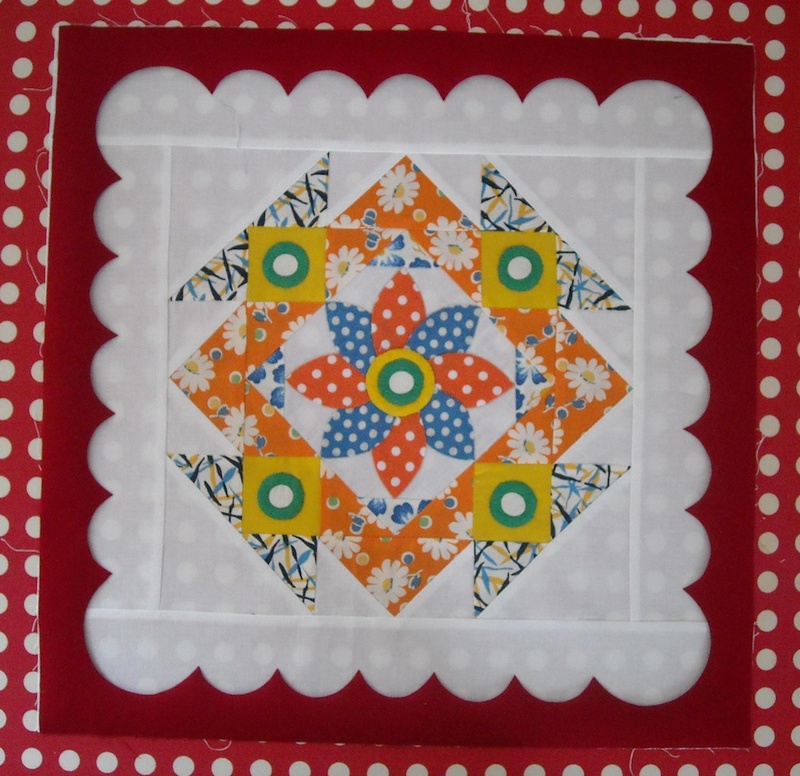 Now lay your completed quilt block out on your work surface, right side up, and lay the marked red square on top of it, also right side up, matching up all the raw edges evenly. Pin the red piece to the block. 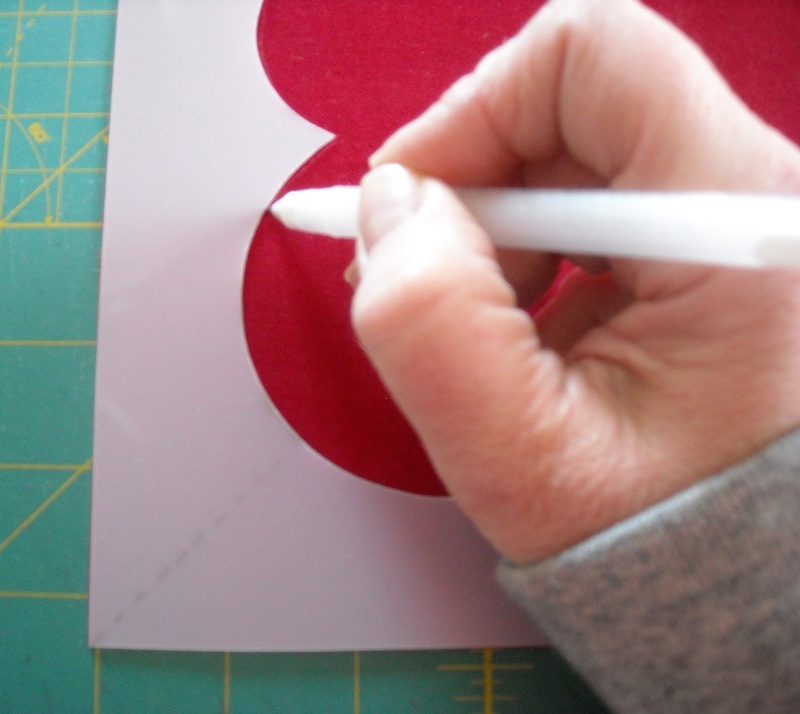 I use these little 1/2″ sequin pins, and pin them about 3/8″ from the marked line through both layers. Use plenty of pins to hold the frame securely in place, and pin around the entire frame. 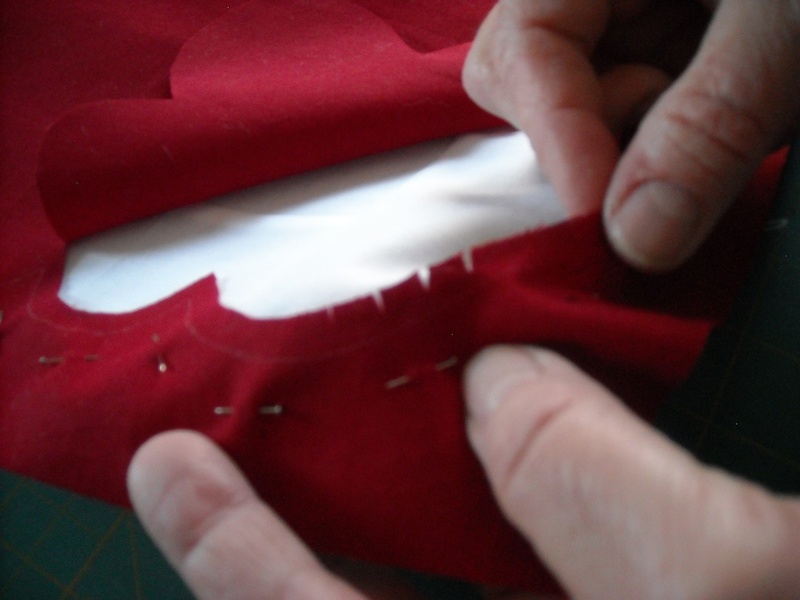 and very very carefully snip a small slit in the inner part of the red frame piece. 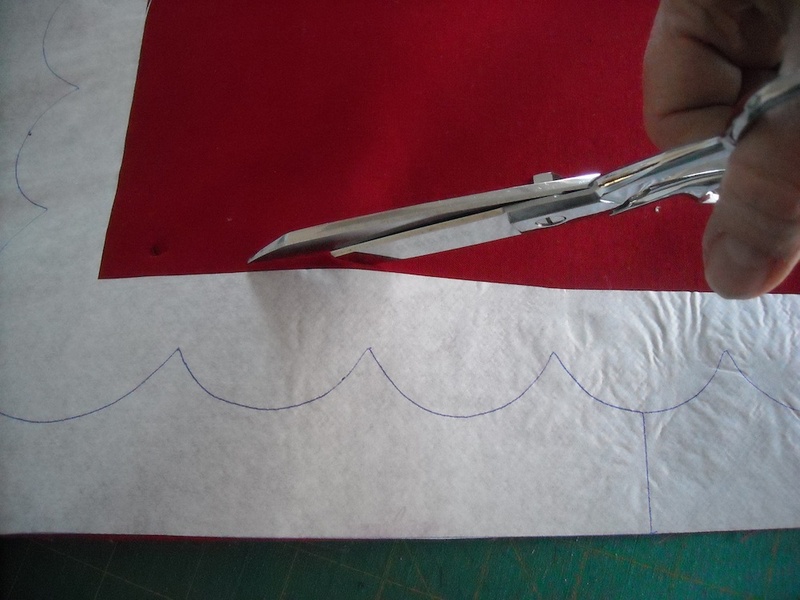 Slide your scissors into the slit, and being super super careful to cut ONLY the red fabric, cut 1/4″ inside the drawn line for a short distance. I do just a couple scallops at a time. This keeps the rest of it as stable as possible while you’re stitching. 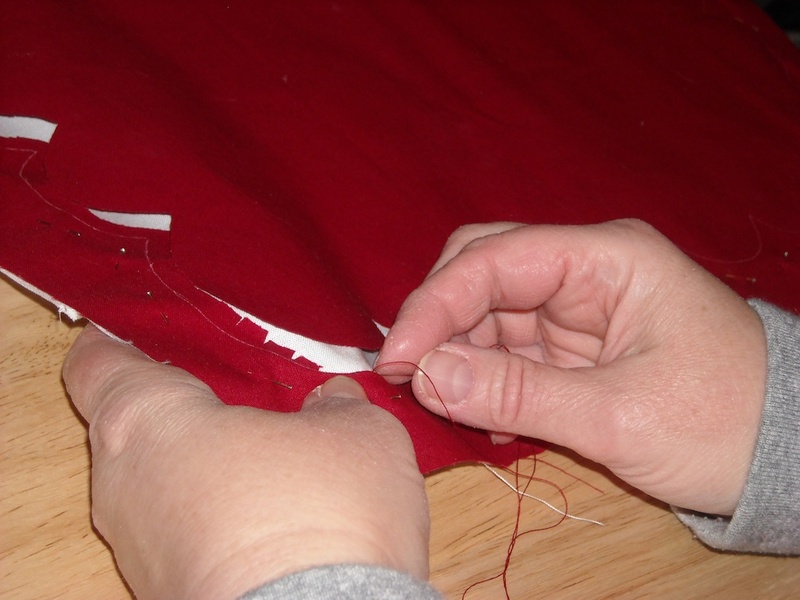 Clip into the seam allowance on the curves about 1/4″ apart, so that the turned-under portion will turn under easily and lay flat as you stitch it down. 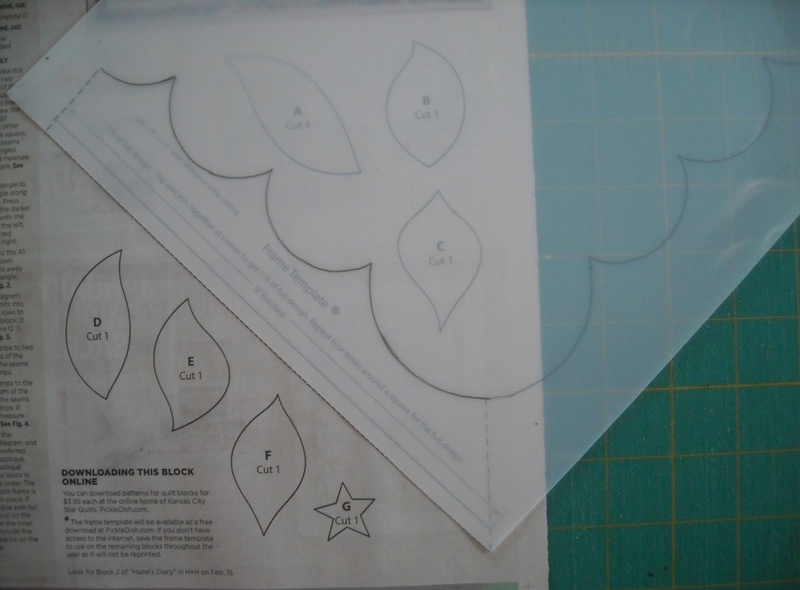 For extra help with how the stitching is done, read this post: How to Applique a Leaf. then stop and cut some more. 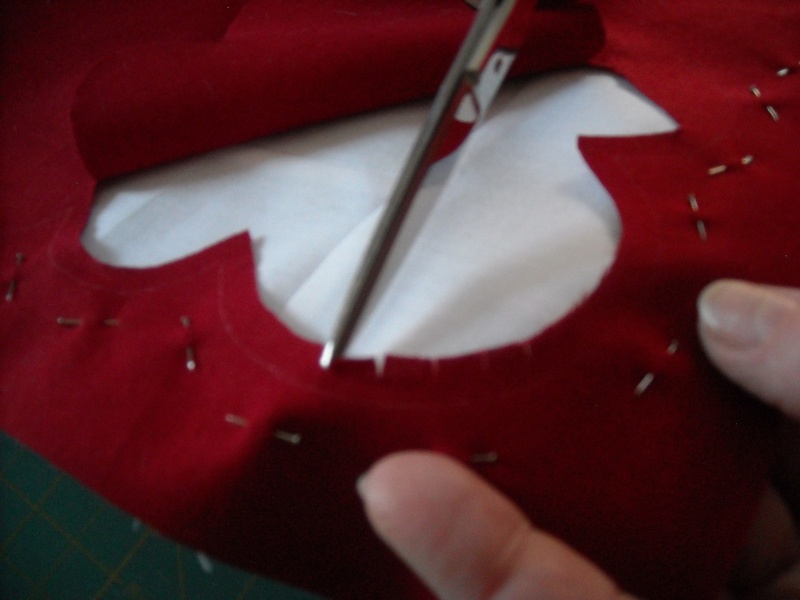 Don’t forget to clip the curves before you continue stitching. Continue in this fashion around the entire frame, and you’re done! Wasn’t that easy? 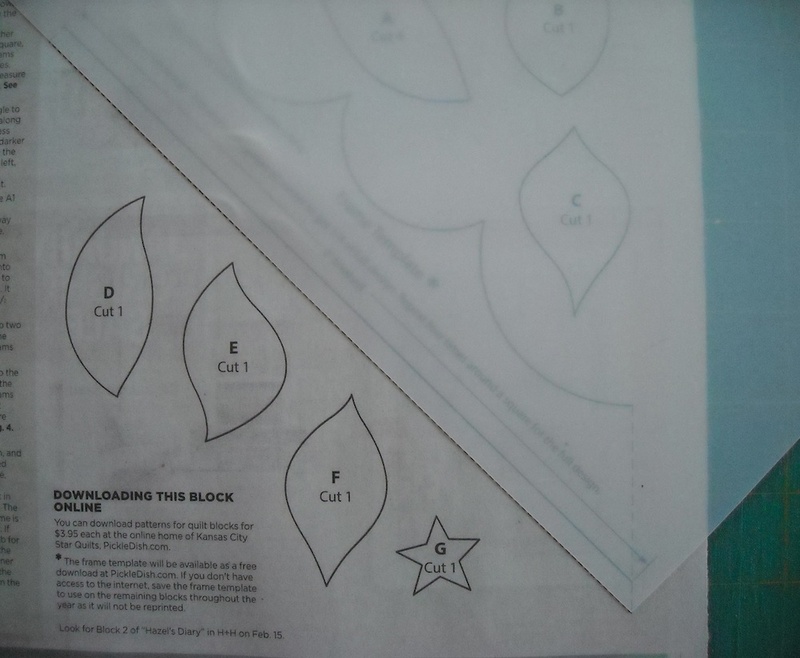 Be sure and save your template, because you’ll need it for most of the rest of the blocks in the Hazel’s Diary quilt later on. And if you prefer, here’s the instructions for the . 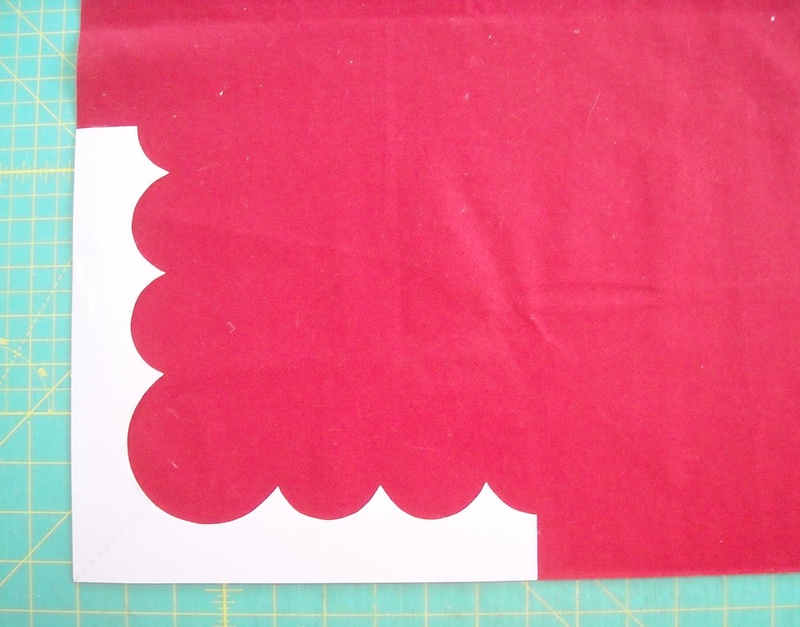 . .
You’ll need your finished block, your piece of red fabric for the frame, matching thread for sewing, paper-backed fusible webbing (I use Heat ‘n’ Bond Lite), and a pair of scissors (for fabric and for the paper-backed webbing). 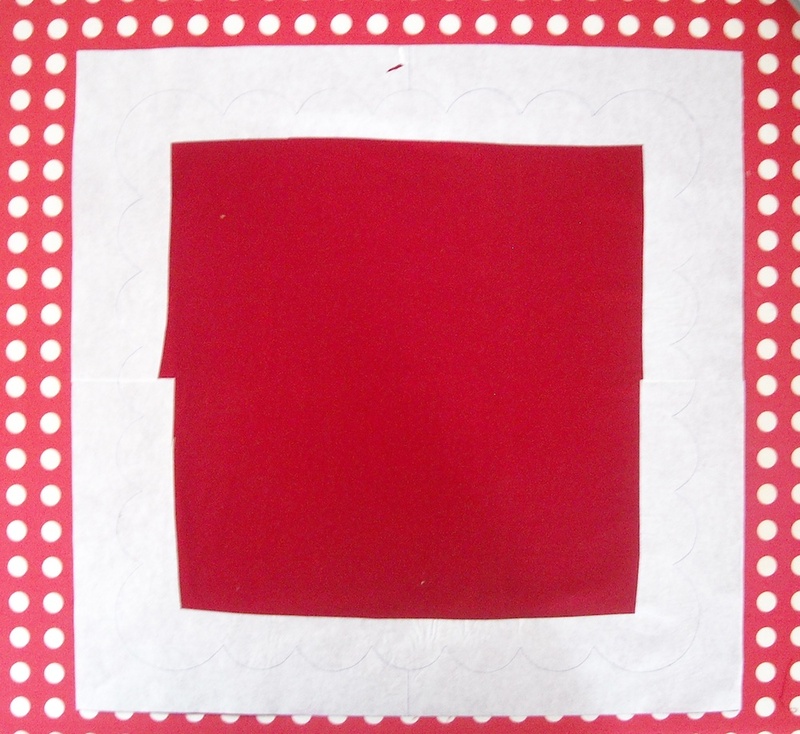 From your red frame fabric, cut a square 18 1/2″. Since Heat ‘n’ Bond Lite is only 17″ wide, we’ll have to make our fusible piece in two halves. 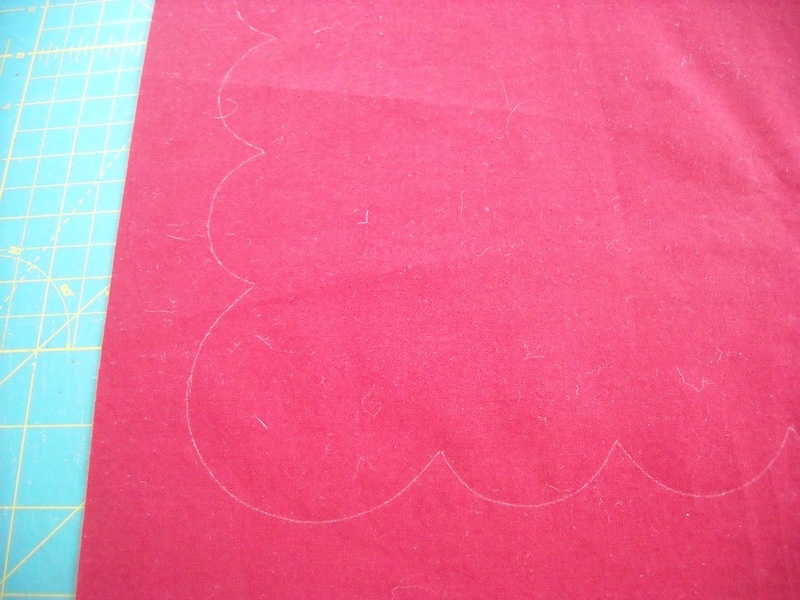 Begin by tracing the template (see above) onto the paper side of the fusible web. Trace 1/4 of the design. Then line it up to form the next corner and trace again to get half the design. Now, do this again to make the other half. 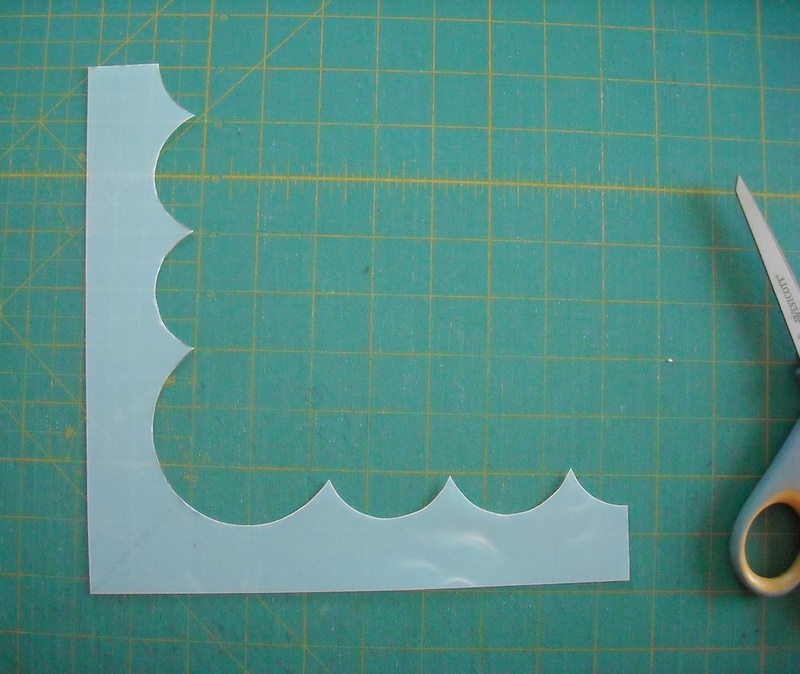 Cut each piece out to look like the piece below, by cutting ON the straight lines, and NOT cutting on the curved lines, but leaving a margin of paper around the curved portion. Lay the red square out flat on your work surface, wrong side up. 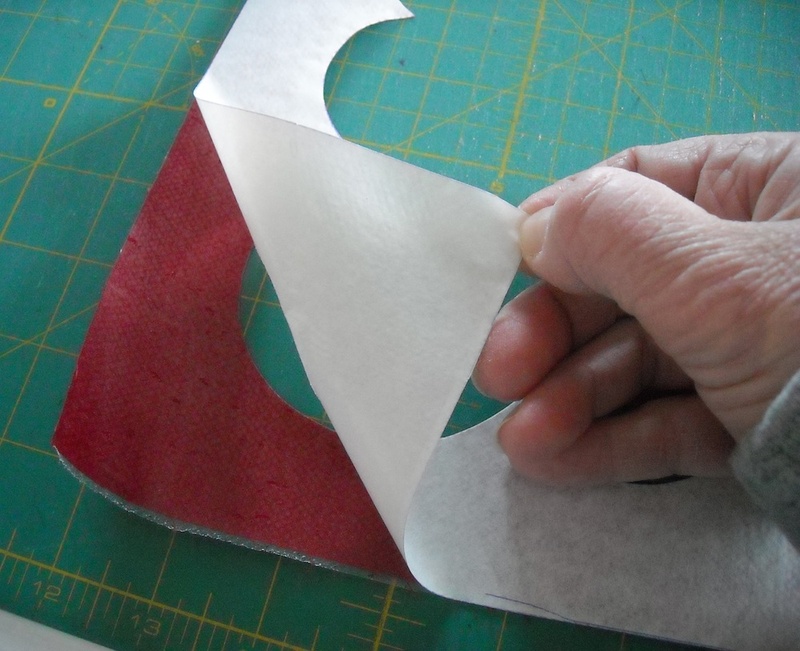 Position one of the halves of the fusible paper piece on the red square, matching the straight edges up with the raw edges of the square. Fuse in place according to the instructions for your particular brand of fusible webbing. Now position the other paper half in place and fuse it on. Snip a slit in the inner part of the red frame. 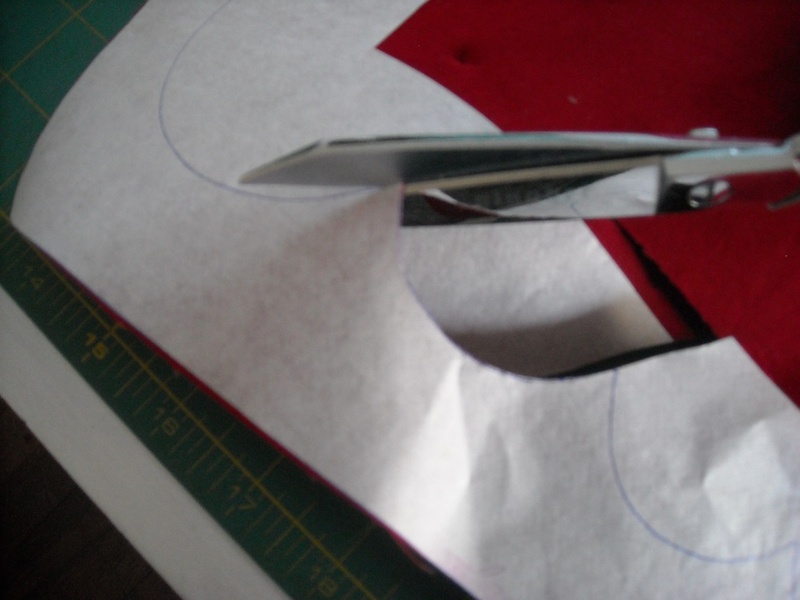 Slide your scissors in the slit, and cut out the middle of the frame ON the drawn line. 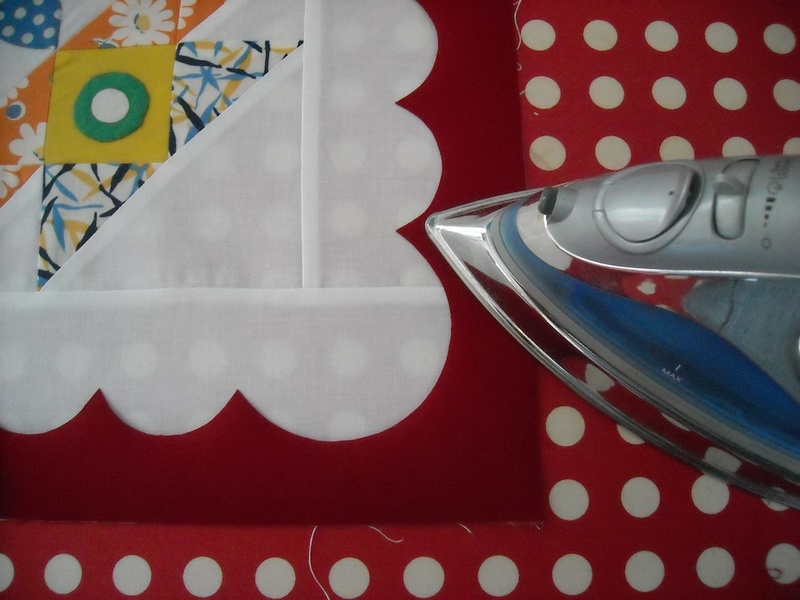 Lay your completed quilt block out, right side up, on your work surface. and position it on top of the block, aligning all the raw edges. Now it’s up to you to finish the inside raw edges of the frame however you wish. 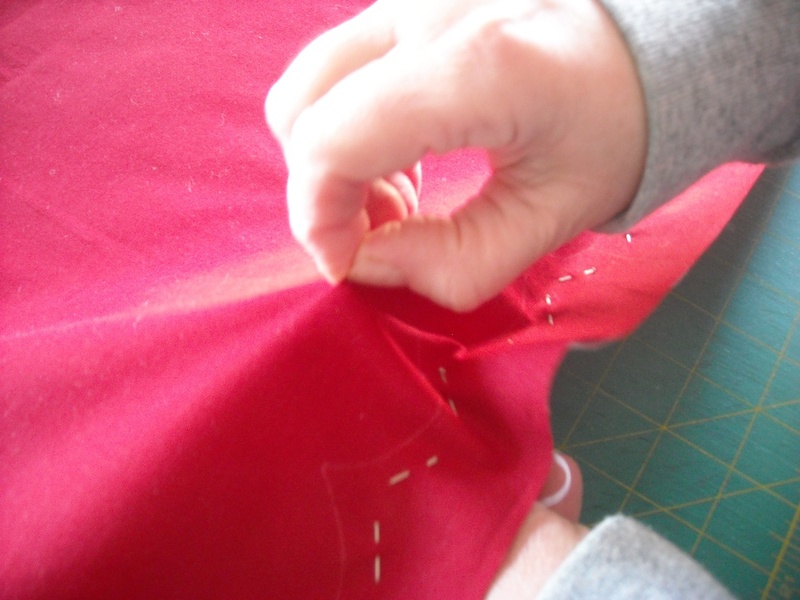 You could do a blanket stitch by hand or machine, or a satin or invisible stitch with your machine. I leave that up to you. 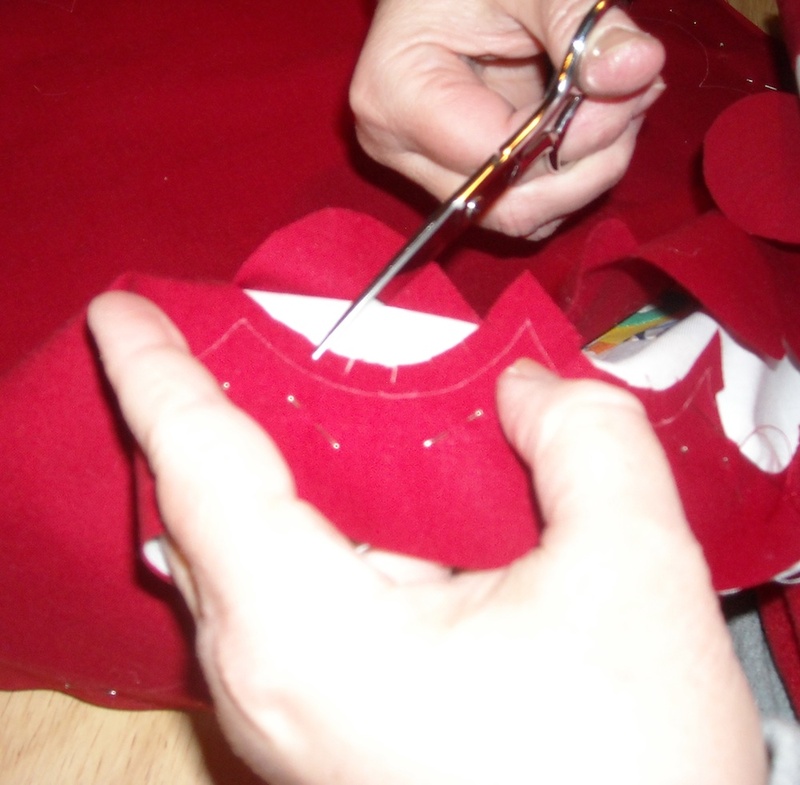 For some additional information on fusible applique, check out the links below. And that’s all there is to that! I hope this tutorial has helped you understand how easy it is to apply the frames to the blocks. If you have any questions, just leave me a comment. 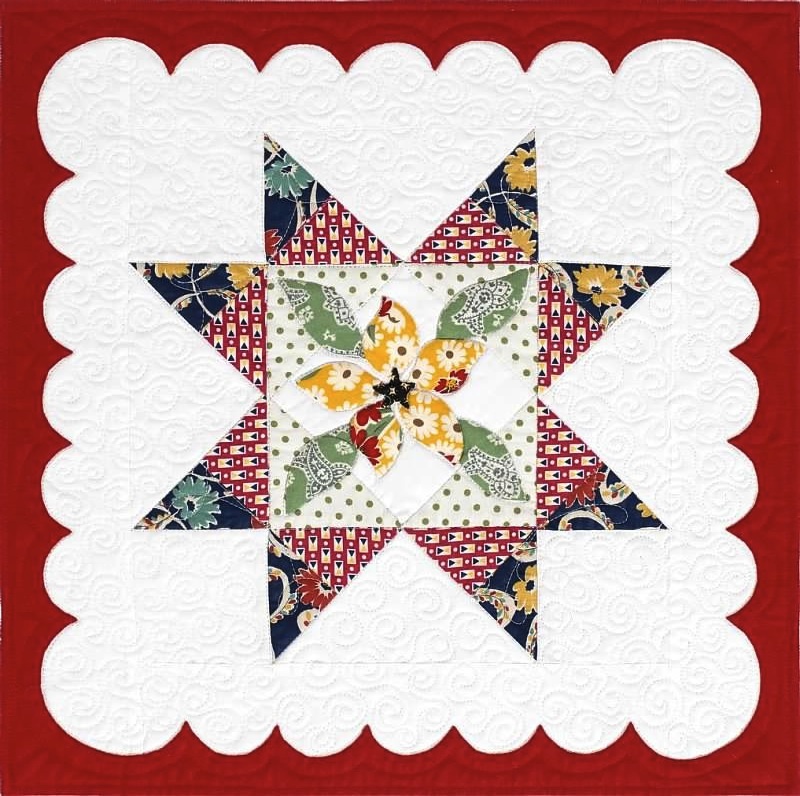 When I first looked at it, i thought you had scallop cut the white border and appliqued it on to the red. Thanks for explaining the method so clearly. I am making KC Star BOM this year. 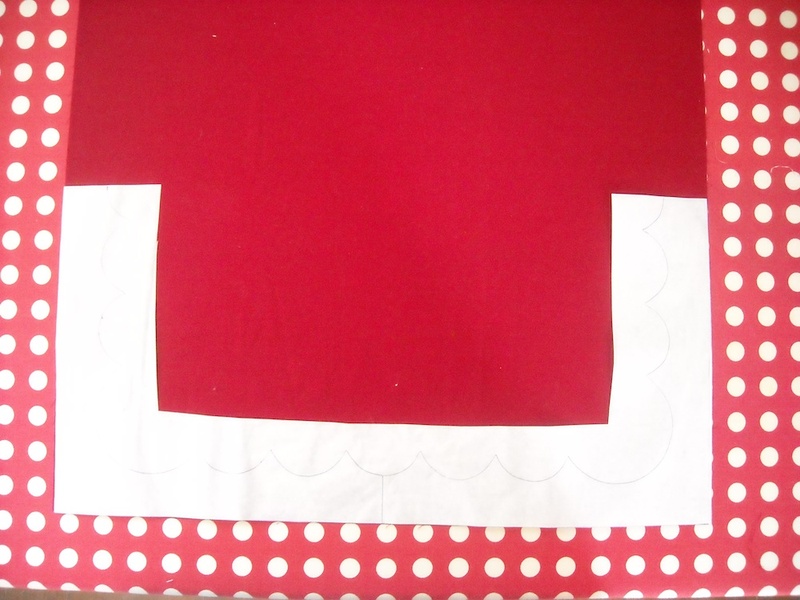 My question is: I have made the red frame template and cut the fabric 18 1/2 “. 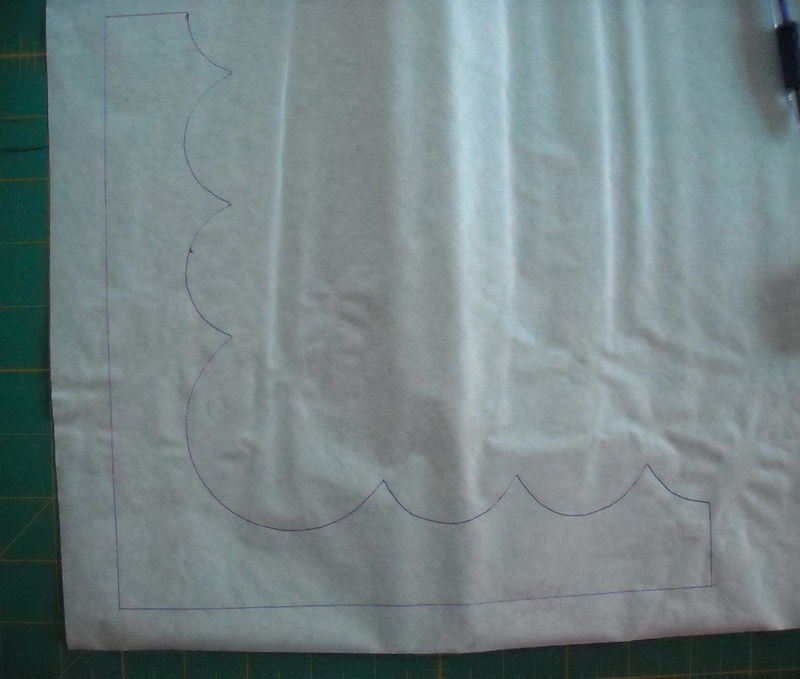 The template doesn’t come to the center of the fabric when I place it on each corner. Is it suppose to be that way? Thank You!